It would not be wrong if we say that cable TV has added a whole new level of spice and color to our sitting rooms. Days of lackluster and mundane TV stations have definitely seen the door. Those days, when TV channels go on break by 12 pm and returns by 3 pm then close by 11 pm for the day, have been long gone. Now we have TV stations that are working round the clock to ensure maximum satisfaction of whoever that is watching. With the widespread use of cable TVs and satellites, one can get to watch a wide array of TV channels with both local and international coverage. Advancements in technology have also aided the now ubiquitous use of cable TVs. Cable TVs have become our eye into the world. We could stay in the comfort of our sitting rooms and be omnipresent and omniscient…Lol! Literally, cable TVs have been a constant source of information and entertainment. Earlier on, TV signals were transmitted over the air by radio waves and were received by antennas on the television or on the roof of the house. Satellite dishes replaced antennas. These satellite dishes get these TV signals from the satellite orbiting the earth and transmit them for viewing in the television. Now one doesn’t need antennas or satellite dishes to get access to the large variety of TV stations available for viewing. High-end fiber optic cables are now used to transmit light pulses onto the television. The signals these cables carry are very strong and sharp. Cable TVs entered the Nigerian market in the early 2000s. Then, it was not affordable. It was strictly for the very affluent, a show of luxury. The price of the decoders and installation were rocket high. Asides the high price for the decoders, there was also the issue of a constant subscription to stay connected. And this was not small money too. This caused the usage to be limited then. But now many more cable TV companies are pitching their tents in Africa and making the Cable TV affordable to the common man. This has led to competition in the market amongst these service providers. Once, it was just the almighty DSTV but now there are varieties sprawled across the county that one could choose from. Asides the very popular DSTV, there are CONSAT, ACTV, Multi-choice’s DSTV Nigeria, MyTV Africa, TrendTV, Startimes, and the newly popular GoTV. Startimes and GoTV are peculiar in the sense that you do not need a satellite dish to get it working, this feature has made them very popular and in high demand. Because without the dish, the equipment required for installation is cheaper. We’d take a look at the various prices of the available Cable TVs in Nigeria. This is the most popular brand in Nigeria. It is also the most expensive. It was brought to the country by Multichoice, a South African direct broadcast satellite service. They are the favorite cable TV for wide arrays of movies, reality shows and of course the world’s number one sport, football. There are two types of DSTV decoders; DSTV explorer and the single view HD also known as the zapper. DSTV explorer is the best with wide channel range and it costs between 30 to 40 Thousand Naira without installation and 55 - 61 Thousand Naira when paying for installations. DSTV single view HD (Zapper) costs between (N9,900) Nine thousand, nine hundred Naira to (N13,000) Thirteen thousand Naira without installation and 15 to 18 thousand Naira when paying for installation. This is the favorite cable TV for those who are Zee-world fans. This cable TV is relatively new in the Nigerian market but has already penetrated deeply. This is one of the cheapest and the most affordable cable TV service available. It has beautiful channels that would rock your world. Generally, GOTV decoders cost 7,700 Naira but what differs is the subscription plan. There are two types of subscriptions; GoTV plus which cost 1,900 naira every month and GoTV max which cost 3,800 Naira. This is an offshoot of a Chinese cable service company, Startimes media. It was introduced in Nigeria after the collaboration of NTA and Startimes media in 2010. Startimes decoders are of three types; “The SD decoder which is 4,500 naira, the HD decoder which is 7500 naira and the Combo decoder which is 6,900 naira. This is another affordable cable TV. Decoders are priced at 7 thousand to 10 thousand Naira. This is a Nigerian cable TV that has been around for over 15 years. It is also known as CTL and has their headquarters at Port Harcourt, Rivers State. Their decoders range from 8 Thousand Naira to 10 Thousand Naira. 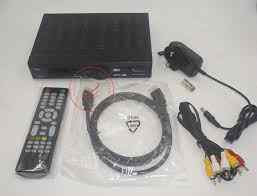 This is the newest and cheapest cable TVs, the decoders cost 5 Thousand Naira only. Here is the list of available Cable TV decoder and their Prices in Nigeria 2019. Do not hesitate in making your choice today, and choose the best among them all. They are indeed very affordable, get one today so as to spice up the color in your sitting rooms. You are welcome buddy, thanks for coming here. I was extremely relaxed to know that my DSTV experts also provide TV wall mounting services because I was urgently looking for someone who can help fixing the wall mount for my newly purchased TV.